Do you want to learn German in Zurich? Learn German in Zurich in one of the most beautiful cities of Switzerland! We offer convenient and effective courses. Our brilliant team of teachers teach in their native language, so you will learn a perfect pronunciation from the very beginning. You can choose between several courses. The course contents will be fully adapted to your needs. We guarantee that your German will improve at Sprachschule Aktiv - Learn German in Zurich - Studying German in Switzerland ! Write us and we will help you! Do you want to learn German? We offer German courses from beginners to advanced levels. Our courses are divided into the following levels A1, A2, B1, B2, C1, C2. At Sprachschule Aktiv you will learn German in small groups. The crucial aspect is the number of participants: each group has no more than 10 members. In a small group you have the opportunity to focus on the lesson and speak German as much as possible. Our team has brilliant German teachers, who are qualified and eligible and create a pleasant and comfortable atmosphere for students. The key to learn a new language is to have the courage to talk to Germans. Our teachers encourage students to speak and communicate in German during the lessons. They do a great job with our students and teach much more than just language. 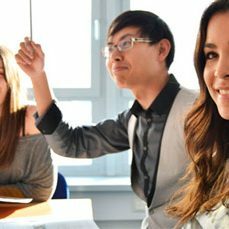 If you already have basic knowledge of German, you can check your level through our placement test in our School in Zurich or on-line. After the placement test you will be assigned to the right course. Your German will improve quickly and effectively! The first lesson is a trial lesson. Is the course too easy or advanced for you? Can’t you really connect with the teacher for his or her teaching methods or attitude? After the first lesson, you are free to change the course. It is necessary to have a student visa if you want to attend a German course in our language School in Zurich. As a lack of fluency in German can complicate the procedure, we will deal with any formalities and authorities. The address of the School is Wehntalerstrasse 293 in 8046 Zurich. The school is easily accessible with the local public transports or by car. Attending a German course in our school you will not only practice grammar and conversation, but also you will learn about Swiss culture and way of life. For this reason we organize regular trips and other activities. Attending the course is for you without risks. If after the first lesson you are not happy with the course or the teacher, we will refund your fee. Copyright ©2017-2018 Sprachschule Aktiv Zürich All Rights Reserved.